When Jo, Bessie and Fanny move to a new home, an Enchanted Wood is on their doorstep. 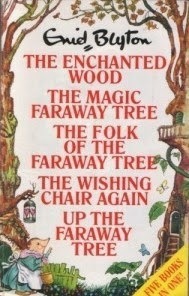 And when they discover the Faraway Tree, it proves to be the beginning of many magical adventures! Join them and their friends Moonface, Saucepan Man and Silky the fairy as they discover which new land is at the top of the Faraway Tree. Will it be the Land of Spells, the Land of Treats, or the Land of Do-As-You-Please? Come on an amazing adventure – there’ll be adventures waiting whatever happens. These stories are so special to me, having read them a million times each when I was younger. I'd had a craving for a blast of nostalgia, but my copy was no where to be found. Looking to buy a new copy I found, in a serious case of political correctness gone mad, the childrens' names had been changed to Joe, Beth and Frannie, and Dame Slap was now Dame Snap. Ridiculous. Luckily, I found the above edition in a charity shop with the stories having escaped diplomatic amendments. These books are nothing but artefacts of their time; a little girl going by the name of Fanny isn't going to warp any modern-day kid's tiny little mind. I was captivated by this book when I was younger, and I was just as captivated almost twenty (twenty?! Ouch!!) years later. Blyton's imagination is awe-inspiring, and the morals she weaves into the tales are something to learn from and respect. The sheer adventure, mystery, and magic running through these pages is absolutely delicious, and everything about the stories is perfect for both children and adults to enjoy. They're not something I'd recommend for adults to read alone (unless, like myself, you're reminiscing), however reading these with kids would really be something special. A must-read for kids - just make sure you find an older version. I'm sure Dame Slap is much more formidable than the Dame Snap she's become.